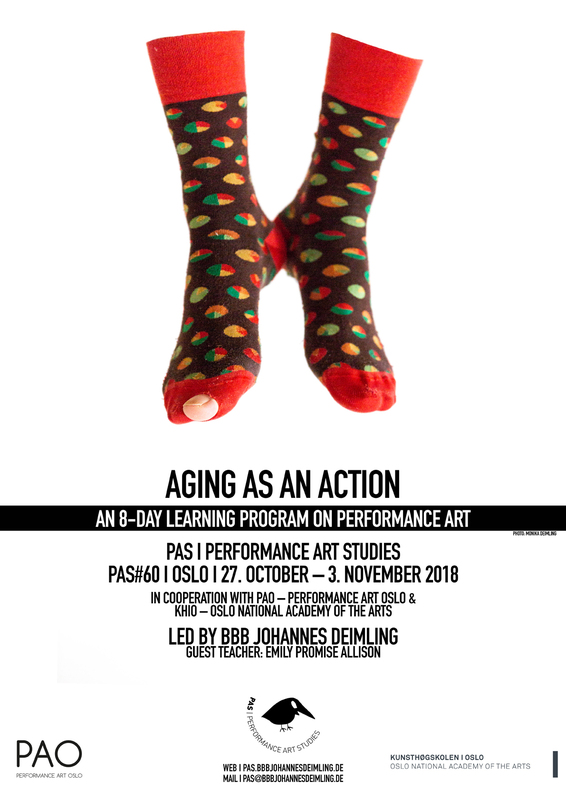 After PAS #42 (2015), PAS #50 (2016) and PAS #58 (2017) we will continue the fruitful cooperation and artistic dialogue with PAO – Performance Art Oslo with PAS #60 | ‘AGING AS AN ACTION’. Time is an enormous phenomenon. While researching the different aspects of it, we found there's research showing that the faster you move the slower you age. Does it mean that you can be so busy in life that you forget to age? Aging as an action. There's also the perspective of forgotten time: "Every time a person dies a library is burned down". The scale of time changes depending on age: when you are younger an hour is a larger percent of your life. Also, we found that the traditional Maya calendar states that time is quickening. We are also interested in the perspective of physics. When Einstein talks about the space-time he states that the past and the future exists just as much as the present. What does it mean that time is space-like? Is it possible for us to understand? AGING AS AN ACTION is facing this various time-research on an artistic level; because we believe that artistic questions are similar to scientific questions. We hope to find new approaches that could change our perception both in the act of creation and during the act of sharing with an audience. The use of performance art allows us to come closer to the point of a direct experience with our bodies. Performance art includes the time aspect by its nature, and with its ephemeral gesture it leads inevitably to knowledge about time. We use the body as a measure instrument. We explore how the body and the space are influencing each other. The relation between them could be understood as time - time in art as a consequence and a condition of a body in a space. Time allows us to move, to let the relationship develop. Thus for us the body is an essential instrument to investigate time. The intensive use of space within the work with the body will offer a relation to the context, and through this, a cultural aspect. What creates the specificity of a space and how can we use it for articulating something?